Sekondi, Jan. 21, GNA – Lieutenant General Joseph Henry Smith (rtd), Minister of Defence on Friday commissioned a fast attack craft, christened GNS Stephen Otu, into the fleet of the Ghana Navy in Sekondi. 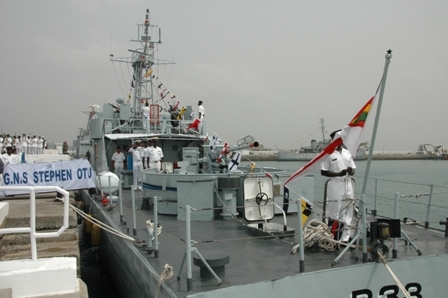 The ship which was donated by the South Korea was named after the late Major General Stephen Otu, the first Ghanaian Chief of Defence Staff. President John Evans Atta Mills said in a speech read on his behalf by General Smith that miscreants in the society who were bent on derailing efforts of the Government to make the country an icon of stability, peace and tranquillity in the sub-region should advise themselves before the long arm of the law caught up with them. He observed that the production of oil had considerably changed the country’s maritime security landscape. “We are already grappling with illegal fishing activities, smuggling and trafficking of narcotics, which cost the country several million dollars a year,” he said. President Atta Mills said the time had for Ghana to take decisive action against “such bad nuts” to ensure that the country continue to prosper and enjoy good international image. He said government would do all it takes to ensure that the country’s maritime boundaries remained free from such nation wreckers. President Atta Mills said he was aware of the current state of the Ghana Navy and of the difficulties they go through in putting ships to sea. He said the Ghana Navy need to be equipped to enable it perform its constitutionally mandated duties. Mr Leek Sank-Hak, South Korean Ambassador, spoke of the longstanding relations between Ghana and his country, which he said was meant to enhance national development efforts. Meanwhile, three new ships are being secured for the Navy to help it better protect the country’s territorial waters. The vessels will come in very handy especially once commercial drilling of crude oil begins. The Navy can effectively ward off any threats to production or transportation. The head of the Western Naval Command, Commodore Timothy S. Appiah, who disclosed this to Joy News, said the ships are being manufactured in three countries; China, Germany and Korea and should be in the country in the next 26 months. Joy News has learnt the new vessels are badly needed as the current navy fleet is seriously depleted and in no position to defend the country’s waters. The Navy is thus unable to conduct the necessary patrols thereby worsening Ghana’s vulnerability to illegal activities. The situation becomes even more worrying at a time when maritime experts believe the West African coast is gradually becoming an attractive destination for pirates because of the lack of high sea patrols. Commodore Appiah, however, said despite their inadequacies, the Navy is leaving nothing to chance. He was speaking to Joy News at the end of a training of naval officers off the West African Coast by a US-led mission, known as the African Partnership Station, which falls under AFRICOM. About 64 officers received both theoretical and practical training on how to better protect their territorial waters against pirates, illegal fishing, drug trafficking and illegal oil bunkering. The training centered largely on four key areas including maritime domain awareness, how to conduct vessel inspections and law enforcement on the high seas, professional development, search and rescue and small boat maintenance. Meanwhile, the Commander of the US Africa Command, General Ward, has reiterated the commitment of his government to assist in improving the professionalism of the Navy. This entry was posted in AFRICA, AFRICAN ARMED FORCES, DEFENCE INDUSTRIES & PRODUCTION, GHANA, GLOBAL DEFENCE NEWS, MILITARY HARDWARE, MILITARY PHOTOS, OIL & GAS, WEST AFRICAN STANDBY FORCE. Bookmark the permalink.